My mentor and teacher was the iconic American theatre actress, Uta Hagen. Ms. Hagen, as she preferred her students to address her, was particularly well known for her performance as Martha in Edward Albee's "Who's Afraid of Virginia Woolf?" When she wasn't acting brilliantly on Broadway, she was teaching brilliantly at the famous HB Studio on Bank Street in New York City's Greenwich Village. The legendary acting studio was a lifelong project opened by her husband, Herbert Berghof, in 1945, and flourishes today despite both their passings. Acting class with Uta Hagen involved practical, useful, direct instruction and an enormous amount of cigarette smoke. When she played Martha, she smoked. Pretty much when she played anything, Uta Hagen found a reason to smoke. She was good at it. She blew great puffs that followed her in a wake of powerful emotion. She used cigarettes as props both on stage and off. The other night I watched another American star onstage here in Los Angeles. 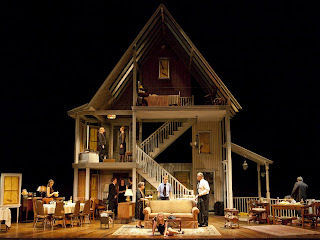 In eight performances a week, the Oscar-winning actress Estelle Parsons rages across the boards as Violet in Tracy Letts' play, "August: Osage County." In a powerful performance over the course of three and a half hours, Ms. Parsons attacks language as only the truest of acting animals are able. And she's smokin'. The actress has to clamber up and down a steep set of multi-level staircases. She must dredge, from the pit of her stomach, an emotional hurricane not unlike Hagen as Martha. And her character smokes...a lot. 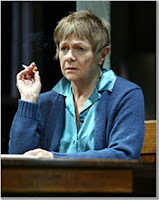 Here's the difference: Whereas Uta Hagen actually smoked and smoked real cigarettes; Estelle Parsons, with good prop cigarettes, makes us believe she's smoking for real. It's all in how she uses the prop. She holds the baby in her mouth and speaks...but doesn't inhale. She sweeps the air with the thing, letting curls of smoke billow around her body...but doesn't inhale. She lights up gratefully as a real addict would and, when she stubs it out, she means it. Estelle Parsons is eighty-two years old. She says she swims or runs everyday and does yoga. I wanna be her when I grow up. I remember her in "Miss Margarida's Way" on Broadway. She's a class act. Estelle Parsons knows her stuff.